« Skeptical scientists are like… frauds who hunt yetis? For those commenters who are following the news and proceedings in detail as it travels through the cogs and gates of parliament, please share your thoughts on this thread as it unfolds. Thanks to those who have the time to follow the details. I’ve moved relevant comments from other threads to here. I thought that the Governor General could only give assent to a bill when it has passed both Houses after which it becomes law. The Governor-General here it appears has assented to the bills before being passed by both houses. 1 The House met, at 9 a.m. The Speaker (Mr Jenkins) took the Chair, made an acknowledgement of country and read Prayers, 9:00:21 AM. Industrial Chemicals (Notification and Assessment) Amendment (Inventory) 2011. Higher Education Support Amendment (Demand Driven Funding System and Other Measures) 2011. Education Services for Overseas Students (Registration Charges) Amendment 2011. Education Services for Overseas Students Amendment (Registration Charges Consequentials) 2011. Telecommunications Legislation Amendment (Fibre Deployment) 2011, 9:01:22 AM. Debate adjourned (Mr Fitzgibbon, 1:55:12 PM), and the resumption of the debate made an order of the day for a later hour this day. Kevin you are misinterpreting the transcript. The list of assented bills is the 2nd scheduled activity and is in a separate heading to the 3rd topic about debating the CEF package. The use of bolded numbers was meaningful, not just decorative. They were separate lists of bills. Was there a point to this? Is there a conspiracy I am missing? Just hang around. Most conspiracies seem to get aired here eventually. I have certainly learned a lot about some of the more obscure beliefs firmly held by some people from coming here. Abbot just moved that today’s standing orders be set aside and replaced with the PM answering two questions as to 1) why it is right to introduce the tax at the worst possible time and 2) why it is right to introduce the tax that she said she would not introduce. It appears from Abbot’s speech that at this point Julia Gillard left the chamber. The word he used was “scuttled”. I am feeling numb !! That this Government would inflict on us the people of Australia such an insidious tax is beyond words !! I hope they rot in hell for what they are doing to this great country. My Grandpa, who fought for this country in WW II, he was in the 2ND 43RD, would be rolling around in his grave at the prospect of this country going down this road. What did he fight for? Is Australia worth fighting for now? Damn right it is, this Carbon Tax must be stopped, where is Superman ??? CO2 is not a pollutant, this tax is a joke, this tax is a con, this govt and PM Juliar are beyond contempt, they are traitors. God help Australia !! Election Now !! Those guys didn’t like to talk about what they did, but you’re right. They would be shaking their heads wondering how it all came to this. The 2/43 Batallion has a proud History. Part of the Tobruk Blockade, hence one of the original ‘Rats’, then Palestine, then on the North Coast of PNG. Les Starcevich VC was in the 2/43. Cheers for the recognition Tony. I grew up in Loxton S.A and there we have every VC Winner and other famous war heroes as street names. I vividly remember driving down Starcevich Road on the way to an old flames house. As I get older, the more respect I have for Pop, and certainly a dam lot more than what I have for the PM. I live in Cairns now and he used to tell me about his jungle training up on the Atherton Tablelands, before the New Guinea campaign. Those were the days and I hope we never do it again, but something is going to give in this world, sooner or later I believe. Election Now please PM Juliar !! The 2/17 and the 2 /43 were in the same place at the same time for the duration. Details intricately every campaign. Great history from interviews with the men who were actually in it. 2/17 – Jack Edmondson VC. Also, the AWM has a good book with all the VC recipients called ‘They Dared Mightily’, only available from the AWM. This is just one battle in the war, never surrender! More battles yet before the job is done. Got the gallery stacked, enjoy the fireworks. Where is the RSL when you need them? It was clear last September, when the Gillard / Green co-habitation was announced that appropriate parliamentary process, and democracy with it, wast to be hijacked by a pre-committed imposition of a “ruling” elite’s “consensus.” Nothing as confusing as a serious debate was to be tolerated. Hence Dennis Jenson’s papers are refused tabling, and concerned submissions are declined. This is government masquerading as democracy, when in fact it is a government nobody intended, acting as a one vote majority dictatorship. It is now unstoppable. The Greens agreed to the only contentious (in their eyes) legislation, which was the steel industry slush fund. From here on it will get rammed through both Houses short of some kind of miracle… like Craig Thompson growing a conscience and quitting politics before Wednesday … LOL Yes, I couldn’t keep a straight face either. It is now up to the Coalition to get in as soon as possible and kill this mess before it does too much damage. Once the vested interests have their claws into the economy it is very hard to dislodge them (look at the NSW Government buckling on solar panels for a recent example). Julia Gillard today compared the carbon tax to Labor’s establishment of Medicare, telling MPs the opposition would be unable to unravel it in government. Except that article does not have an actual quote. If you can find an actual quote of the either the Prime Minister or any cabinet MP actually saying that a future government will be unable to unravel the tax law, this may be gold for a High Court challenge to the carbon tax because not only would the legislation have the effect of binding future parliaments but such a quote could be construed as evidence of the government’s intent to create that bind. Such binding is widely believed to be unconstitutional for reasons previous discussed in this blog. Good God, I hope you’re right AMcR. Well if that is the case, then The Australian must be putting words in the PM’s mouth. something for which they would be called out. Time will tell. What a pity the Australian parliament is not keeping half an eye on what is happening in the UK. As a result, they will probably be enshrining this legislation into law at just about the same time that the UK is beginning to unravel itself from all this unscientific rubbish. Gods but that was mean of you. I clicked the link to Parliament and Julie Bishop was up there. You should have a warning label on that post. What a smart arse you can be Cat among thieves. Give me 1 Bishop to your clown Queen and I`ll wipe you off the chess board…. TBA, this is Julie Bishop you are talking about? The serial loudmouth incompetent hypocritical plagiarist, best known for the Death Stare?? Vying for the title of most useless frontbencher in the history of parliament with the likes of Sophie Mirabella?? And really, i only compare her to Mirabella, because Mirabella was stupid enough to get the Liberal Deputy Speaker to name her tonight (for being a loudmouth rather than an idiot) and following the forms, Parliament voted 71/57 that she be suspended for 24 hrs. As people turfed aren’t entitled to pairs that means Libs down one vote for tomorrows final HoR vote on the Carbon Price Bills. I cant believe this has happened, but it will be a good warning to the other members of the House. Classic, but Sweet!! Welcome all to Gillard and Co’s shiny new playground for fraudsters and speculators. Second reading all related Bills went to the vote. Result – 74 – 73 in the Affirmative. Bills proceed to second reading. no way could i follow this political farce; however, Mark posted the following at the previous thread and it says everything about the insanity of our Govt. as i’ve said previously, they are making it up as they go along and will continue to do so into the future, without a care for all those who get damaged or lose everything along the way. more supply to the market. As well as governments, companies are getting rid of permits to shore up balance sheets in the face of tighter credit markets, acccording to Barclays Capital analyst Trevor Sikorski. And so we prepare to officially become the most stupid country on earth, the entire temporary ruling class of the most radical leftwing government Australia has ever had captured by the fashionable evidence-free junk science of the UN, the first and only country to adopt a massive new industry-shedding taxation regime as a moral example to the rest of a sceptical world, in which only socialist Europe has similarly adopted the demonisation of CO2, which is likely to trigger a trade war with Asia and the USA early next year as it tries to impose new taxes on airlines. I’m sure the zombie trolls who have attached themselves like barnacles to this website will revel in a few months of artificial sunshine before their fantasyland collapses. OMG. I do feel for Australia now. And just at the very moment when the MSM is begining to air predictions of a new Mini Ice Age and acknowledging reports that the sun has a roll. & Britains ‘Greenest Government ever’ is wavering on climate change. Is Australia the only economy left that can afford to indulge the big lie, and while her people know its a lie? The ONLY reason why Aus is going well at the moment is because we are currently a competitive source of energy & raw materials. A while back I was sent a book which had some figures on the foreign earning component of a few industries. Add in the rural exports & probably about 10% of Aus commerce is generating the fat. When the products we flog become un-competitive , the A$ will get shabby , interest rates will rise ( to keep the needed foreign capital coming in) & in a potentialy declining real estate market, a big chunk of the “brick veneerial battlers will find their mortgage is worth more than the home. The riots they had in Britain may yet become Australian past time. Sorry, just a little cough I have there. Doc says it’s a case of “passivaggressivitis”. The Hansard of the lower house is not up to date yet. So remember, you heard it here first on JoNova. Wait till the friends of the dirt Greens get their way and close down Hazelwood. Watch the stunned looks on the face of the populace as Victoria stops dead. You won’t hear all that much about it though, because having ground to a halt, there won’t be any electricity in Victoria, so nothing will be coming out of there. Greens will be ‘thin on the ground’ when that happens. Naah mate, wasn’t me who supported them. And who will have a job to pay income tax then? If a person is responsible for covered emissions of greenhouse gas from the operation of a facility, the facility’s annual emissions are above a threshold, and the person does not surrender one eligible emissions unit for each tonne of carbon dioxide equivalence of the gas, the person is liable to pay unit shortfall charge. If a natural gas retailer supplies natural gas, and does not surrender one eligible emissions unit for each tonne of carbon dioxide equivalence of the potential greenhouse gas emissions embodied in the natural gas, the retailer is liable to pay unit shortfall charge. The problem is, the greenhouse gases do not belong to the Commonwealth. They belong to the States. The Commonwealth is prohibited from taxing the property of a state, constitution s.114. Here is a slightly modified cross post from David’s Niche Modeling of a couple of days ago, sent to A Bolt today. Ownership of Australia’s minerals, with some exceptions for royal and radioactive fissile metals, is vested in the Crown in the power of the States. Thus, Victoria owns its coal. The ownership of minerals in Australia is subject to the primary maxim “Cuius est solum eius est usque ad coelum et ad inferos”, meaning “to whomsoever the soil belongs, he owns also to the sky and to the depths”. Carbon dioxide is a mineral. Indeed, bottled water with CO2 is named “mineral water” by some. If Victoria’s coal becomes CO2 or other CO2 goes into the sky, then we have to define ownership. That which exists under or over Victoria, belongs to Victoria. Section 114 of the Constitution says in its latter part “.. nor shall the Commonwealth impose any tax on property of any kind belonging to a State”. However, section 51 xxxi notes that the Commonwealth has certain powers for “The acquisition of property on just terms from any State or person for any purpose in respect of which the Parliament has power to make laws”. We have not seen much press about compensation in these Constitutional terms. Next, there is a general Constitutional principle that if Commonwealth and State law is in conflict, the former shall prevail. Finally, section 55 notes that “Laws imposing taxation shall deal only with the imposition of taxation, and any provision therein dealing with any other matter shall be of no effect”. Can a carbon tax be legislatively mixed up with carbon trading schemes? So, what we are seeing with that enormous bundle of paper named the Carbon Tax Bill has so many diverse implications that some Constitutional lawyers are bound to benefit. As expressed above, the “Carbon Tax” so named is of doubtful legality, ab initio, and there are many points of clarification needed. b.the day the Clean Energy (Charges–Excise) Act 2011 receives the Royal Assent; and (etc for a long list)(End quote). The creation of the entity named the Clean Energy Regulator has some peculiarities that interact with the straightforward commencement of the Act, should it be passed. There has been some clever boffin work here to get around allegations of non-legaility of the proposed legislation. It’s probably incorrect to even call it a “Carbon Tax” because the ownership of the entity said to be taxable is not clear. I’m totally confused. But then, I’m not a lawyer, just a mug. True enough Sherro; there is plenty in these rotten bills for a number of constitutional challenges; all we need are some litigants with deep pockets and some ticker; after dealing with many large co’s directly affected in profound ways by this TAX I am yet to find any with sufficient guts to initiate any such proceedings. O’Farrell may be a likely alternative and I hope he is not playing any subtle game but waiting for their passing by parliament before fronting at the HC. Bronwyn Bishop [Lib. ]is giving it to them. They’re a bit sensitive when she makes mention of Combet’s new house by the sea. What I find amazing is how 100% of Australian political representatives have been beguiled into believing this CAGW scam. Looking through the Coalition Report on the hearings of the ‘Carbon Tax’ committee, there is an unquestioning reliance on the Policy Recommendations of the IPCC without the slightest whiff of suspicion that these might be based on something other than completely honest and verifiable science. So, right at the start of this report, there is an implicit assumption that the need to reduce carbon dioxide emissions is real and urgent. No appeal is made to any independent science which might indicate that the IPCC case for CAGW is flawed. Apparently there is not one politician who has a sufficient grasp of the science to be able to detect the unverifiable assumptions, the exaggerations, the inadequacy of the Models, the politicisation of the policy recommendations or any of the sheer fraud in the ‘science’ that the public have picked up on since Climate-gate. That, to me, shows the depth of the problem, politically, in Australia. The most necessary task, it would seem, would have been to educate at least one politician to the point where they could begin to question the policy advice that they have been given and to ask the hard questions that would reveal the lack of evidence behind them. This task, it would seem, has either not been undertaken or else has failed. I would hope though, once in power, they would have a Royal Commission into this scam and get Flim-Flam, Garnuat and the rest of the scumbags to put their over paid credentials on the line. They would hold a Royal Commission wouldn`t they ?? Notice Combet refused to give leave for the Coalition to table the 4600 pieces of submission that the parliamentary committee labeled as “correspondence”. Nah, Combet doesn’t need volumes to say, take your pathetic stunt and shove it. You’re a creep; crawl back under your log. Your rude. Sit and spin baby. You keep with the nyah nyah nyah nyah nyah – we won. Sooner than you you think, as the lights start to wink out, as power starts to fail all up and down the Eastern Sea Board, with nothing to replace it, you won’t hear me saying. nyah nyah nyah nyah nyah told you so. It’ll be redundant, in poor taste, and too damned late, because we will have all lost. You lot have really got absolutely no idea what’s going to happen, have you? You think this is gloating? Wait till end November and passage of the Carbon Price through the Senate. Then i’ll have just a little gloat. Enjoy that gloat. After the tax starts to bite there will be precious little to gloat about. And even if there were things to gloat about the wind powered electricity means that you would only have power for an hour a day (if you’re lucky) to find out what they were. I have yet to meet a single scientist that disputes the science of climate change. Show me a single academy of science in the world who disputes the science of climate change. Reckon the Member for Makin is makin’ lemonade with watermelons. Those of us who do not believe the CSIRO is part of a green left conspiracy should not be afraid speak out and to say so. … Do not fall into the trap of thinking that what some web site says knows better than our own leading scientists. Whilst I think the entire party politics institution is an affront to genuine democracy, this is one time where the duplicity of everybody involved stinks and Turnbull crossing the floor would not change the recent parliament voting outcomes. The opposition’s plan for saving the great barrier reef was to cover it in shade cloth. You can’t prove your own sanity by proving the insanity of others. They believe the extreme weather events we’ve seen throughout the world have nothing to do with climate change. They want to do absolutely nothing about it. Ahhhhhh. So much crap in parliament. And now Sophie Mirabella just chucked a hissy fit trying to table a petition so the government is trying to have her removed. Total own-goal there by Mirabella. Parliament at this time of night is a cacophony of galahs. The Ayes have it. Mirabella just got suspended for 24h which means she won’t be available for voting against the bills in parliament tomorrow. It was unlikely to make much difference. I should stop watching now. I have been watching and listening for over 10 hours and 25 minutes today. My parietal lobe is twitching. My last shred of faith in Australia’s political system is soon to suffer a quiet death. I sign off for the evening and leave you all with this screenshot of democracy being shut out in the cold for the purpose of stopping a global warming of 0.00007°C. And now Sophie Mirabella just chucked a hissy fit trying to table a petition so the government is trying to have her removed. Really? I thought Mirabella had a spak and back-chatted the Deputy Speaker @ 10:15:13 PM. 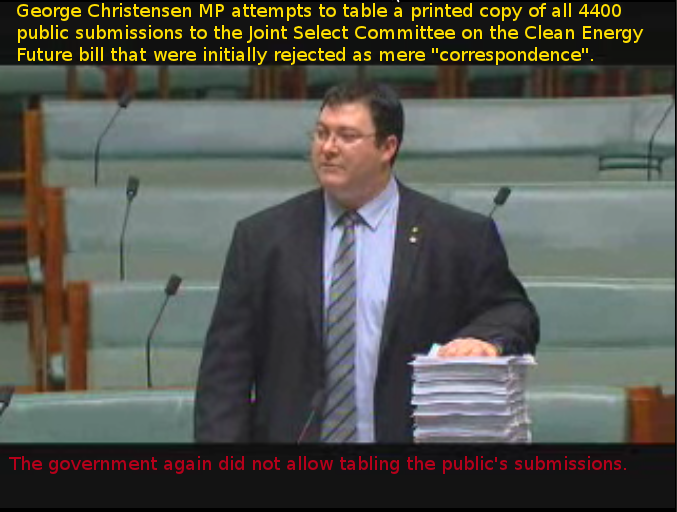 Mr Christensen, 10:37:26 PM, sought leave to table a document. Leave not granted. So the failed document tabling attempt seems to half an hour later, and i dont think it was related to Mirabella’s own goal. Oh, and the Govt wasn’t trying to have her removed. They were supporting the authority of the LIBERAL Deputy Speaker (as is the protocol of the House) who had named her for not putting a sock in it when told, by him. Of interest is that 15 of her fellow Coalition members didn’t make it to the vote. Weird. Trying to decide if its part of some twisted plot, or just Liberal incompetence on display, again?? Matt Thompson writes via email: “Carbon Tax Passed. According to Dennis Jensen the Carbon tax has passed the lower house this evening. I’m not sure if he meant the first round… ? Vote on third reading and amendments isn’t until tomorrow. Should be done by 9 or 10am W.A. time it think. Sorry Mark D. That was my iPhone finger playing up again. I got what I expected not one answer to my question.Plenty of hot air and CO2 but that’s about all.I know how far I’m prepared to go. There’ll be no revolution Fred… until the credit of the government fails. Until then branches will continue to be hacked but no root struck. Scroll forward to to 2017 and the ETS is in place. A young man in a 3 piece pin strip suit drives up to the house on the cattle station in his Government BMW. The grazier meets with the young man with the brief case who says. Hello, I’m from the Government, and I’ve come to measure the methane emissions from your cattle. The grazier has heard about this and knows there’s little he can do to stop him, so he follows the young man around as he counts the head of cattle. He reaches the last paddock, and the grazier says quietly. I wouldn’t advise you to go into that paddock son. The infuriated young man snaps open the brief case and pulls out a large bound wad of papers, and says. See this old man. This legislation says I can go wherever I want. This legislation stops you dead in your tracks from telling me what I can and cannot do. With that, the young man hops the fence and walks off into the distance, as the laconic grazier rolls a smoke. After around a hundred or so metres, the Old Bull in the paddock sees him, and charges towards the young man, who, now desperately frightened, turns on his his heels and runs for his life. As he approaches the fence with the Bull bearing down on him faster than he can make safety, he hears the grazier yelling at him. The legislation son, show him the legislation! That’s good Tony, very good. I’ll be spreading it around for sure. Carbon makes up about 18% of the human body, by weight. If a “carbon tax” was taken to its logical conclusion, it would give a new meaning to Shylock’s “pound of flesh”. POLL RESULTS: Do you support the carbon tax?…..
It’s the sound of ONE HAND CLAPPING…..
Hansen hasn’t met Flannery, then….. GLOBAL WARMING IS NOTHING BUT A TROJAN HORSE BASED ON LIES AND FRAUD, BEING USED TO IMPLEMENT A ONE WORLD GOVERNMENT ! Carbon DIOXIDE is PLANT FOOD and not pollution! ELECTION NOW TO STOP THIS COMMUNISM!!!!!!!! Question—That the Opposition amendment to the Clean Energy Bill 2011 be agreed to—put, 9:10:55 AM. Government mandates are now derived from the UN rather than Australians. Will you vote against Labor because of the CARBON DIOXIDE(PLANT FOOD) tax? Do you agree with Tony Abbott’s stance on repealing carbon tax legislation if in office? Congratulations to the ALP, Greens, Windsor, Wilkie and Oakeshott. Post your bank account details hers so that we can all have YOU , YOU MORON, pay for our ENORMOUS cost of living rises ! YOU seem to have a serious IQ problem! GILLARD AND SWAN ARE LYING COMMUNIST TRAITORS- NO CARBON DIOXIDE TAX !!!! Carbon Dioxide Is Plant Food And Not Pollution !!!!!!!! Civil Unrest And Riots In The Streets Are Now Assured !! The hotheads link sounds entertaining, but doesn’t work. naDevvo’ yIghoS!!! Hab SoSlI’ Quch!!! Today Black Wednesday, marks the DEATH OF DEMOCRACY in Australia !! THERE WILL BE “CONSEQUENCES” FOR THESE COMMUNIST TRAITORS ! AUSTRALIANS WILL NEVER, EVER FORGIVE OR FORGET THIS TREASON ! Shouldn’t it be red wednesday? Or watermelon wednesday? Looks like all our plans are coming to fruition. Soon your money will be worthless and you’ll be voting between proxies we’ve chosen. Klingon might appear to need a cup of tea and a lie down, but even if you actually believe that anthropogenic gullible warming requires costly intervention, the arrogance demonstrated by Juliar (on behalf of Bent Bob) gives anyone but the most politically apathetic or the most dedicated non-thinker very good reason to be angered to the point of needing a cup of tea and a lie down. I don’t credit the beaked bloodnut with the intelligence to have knowingly deceived the electorate about the her intentions regarding the tax on thin air (that’s just a handy means of scoring political leverage next election); she’s just too feeble to admit she doesn’t realistically lead this government and that the cost of her retaining the keys to the lodge was climbing into bed with the watermelons. Juliar shows either complete ineptitude or complete conceit for the electorate when her standard backpedal is to insist that the tax she promised not to introduce is being introduced on the grounds that it’s the right thing for Australia to do (symbolically, sacrificially maybe, even Juliar can’t actually believe taxing some emitters and handing out to the consumers will have any impact on carbon dioxide emissions at all); she’d regain at least a skerrick of credibility if she insisted instead that her lie is not a lie because she said ‘…a carbon (dioxide) tax will not be introduced by a government I lead…’. Emphasis on “I”. We all knew what todays result would be, and know what the result will be in the Senate, but I for one would not have been especially mad, more disapointed that bodgey ‘science’ could be taken to introduce really bodgey legislation. Especially disapointed as even the biggest supporters of the hot air affect start to turn their backs on the whole idea of taxing or trading thin air and encouraging reliance on unreliable energy. I’m put out (and I suspect I’m in good company) by the appalling way the introduction of these pointless bills has been handled by our current crop of insipid politicians. Many of the useless oxygen theives will be reaping what they sow at the next election. I’m off for a cup of tea and a lie down. Catamon, our secret tongue should not be used on these boards. Which must never be forgot! Quit your job and go on the public dole. You’ll end up there anyway. 10 billions Ozdollars to pay the Angelic Bob Greens, soon to be delivered from our first female prime-Judas. All for 3 years of political power and government pensions. When’s the camel-fart amendment to be added to the bill? Scientific footnote – ruminants belch methane, rather than fart it, but “camel-belch” just doesn’t have that ring to it (nor the smell). Political footnote – no untruths were harmed during the drafting of this bill. THE LABOR PARTY AND GREENS DANCE ON THEIR OWN GRAVES !!!!!!!!!!!!! THIS COMMUNISM WILL BE STOPPED !! TIME FOR RIOTS IN THE STREETS !!!!!!!! CARBON DIOXIDE IS PLANT FOOD AND NOT POLLUTION ! The world is at a crossroad. Australia is a battleground for the preservation of “democratic” government. There is still time to reverse and change course, so nothing is entrenched. But, it needs to be gotten on to right away. This legislation is nothing more than income redistribution. The objectives of those in favour of “energy taxes” have not been silent on the desired goal of such legislation. Repeal is still an option, but the window for reversal of course is closing. An election, as the upcoming one in the States, is to be pivotal as to which direction we are headed. Another point, Gillard is more worried about leading Australia down a “global consensus” path, and not so worried about staying in power in Australia. What happens to ousted liberal PMs from Australasia? They head to the United Nations where they reap their reward. Any chance the Gillard government is going to force through the original contradictory legislation. Then it will give plenty of grounds for a High Court appeal against it application seeing as they can’t agree whether its a a tax, a permit or a fee amongst many other faults. Anyone know if they have fixed those “faults”.